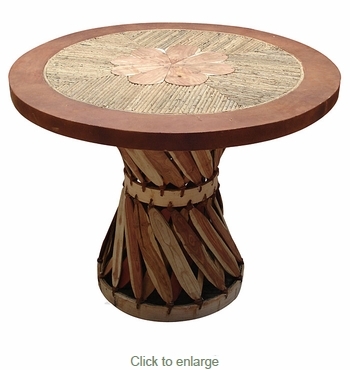 This round twig top equipale table is crafted from tanned pigskin and Mexican cedar strips, is stylish and durable. Equipale furniture will create a southwest or rustic atmosphere in any room of your home. Since each piece of Equipale furniture is handmade from all natural materials, expect slight variations in color and size. Prices are the same for all color finishes except for Cowhide. See cowhide price in dropdown menu above.